Our board of directors represent, vote, and act on behalf of the membership of the Dallas Fort Worth Chapter of the International Society of Certified Employee Benefits Specialists. 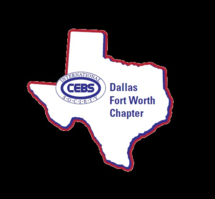 ​We welcome all Dallas and Fort Worth benefits professionals to join our local chapter of ISCEBS. We are a dynamic group and your inclusion will help us to continue to meet our goals of education, networking, and professional development.